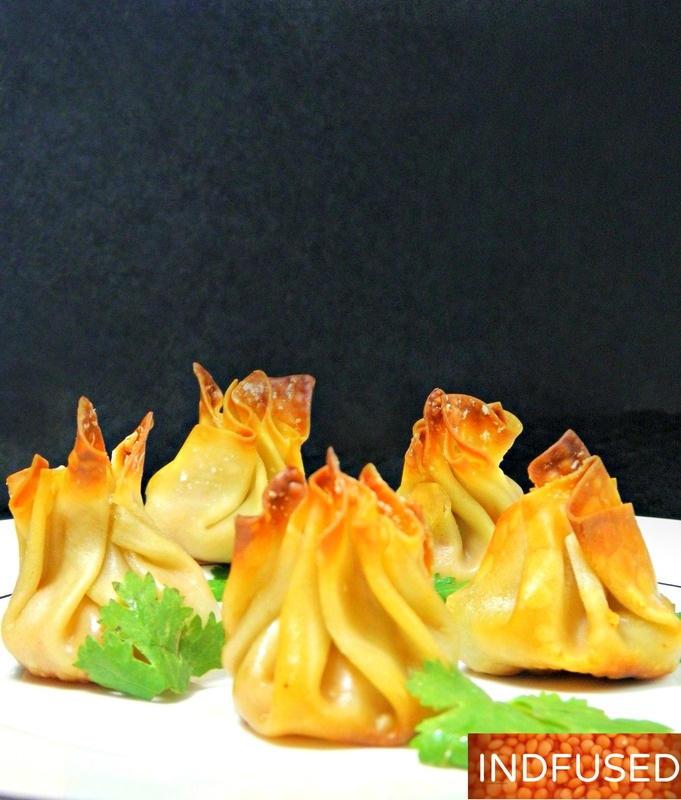 The cute bite size appetizer samosas will charm your guests and this quick and easy recipe will win you over…….find out what the shortcut is! The word potli alludes to a bag or purse. It is said that there are references to a potli being used in Indian history, since Vedic times! They were used to carry gold coins, medicines, herbs and jewels. In recent years, potlis became a fashionable accessory. They are made in gorgeous silk fabrics or woven, beaded and embroidered. For the filling, I used the same stuffing/filling that I have used in the Samosa Triangle for the Weekend Party but you would need only half the amount for these bite size potli samosas. 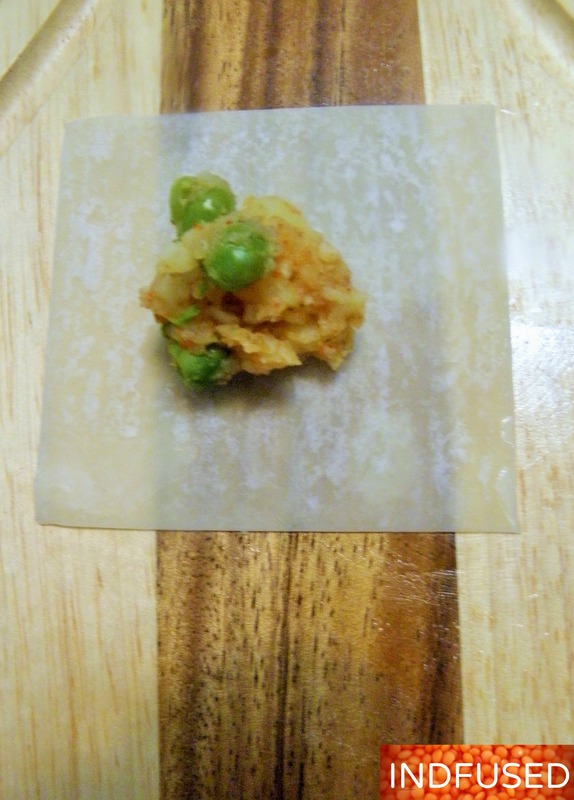 Using one wonton wrapper at a time, put a scant teaspoon of the filling in the center. I kept the other wonton wrappers under a damp kitchen towel. Pull up the edges and give it a slight pinch just above the filling. Moisten your fingertips slightly if the wonton wrapper does not pinch easily. Repeat with the other wonton wrappers and filling. Brush or spray lightly with oil. I used olive oil and also sprinkled them lightly with kosher salt before baking. That’s it! You have 48 appetizers ready for your party! Make ½ the quantity of the potatoes and peas stuffing/filling according to the recipe in Samosa Triangle for the Weekend Party. Remove the wonton wrappers from the packaging and place them under a damp kitchen towel. 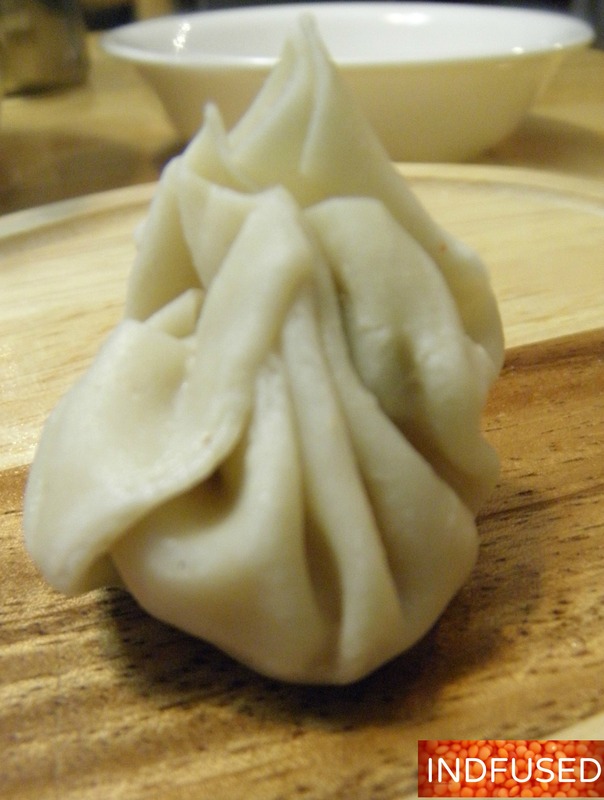 Working with one wonton wrapper at a time, place a scant teaspoon of the filling in the center. Draw the edges of the wonton together and pinch them just above the filling. Place it on a greased baking sheet. Repeat with the rest of the wonton wrappers and the filling. Brush or spray the Potli Samosas lightly with oil. Sprinkle lightly with kosher salt, if using. Bake in the preheated oven for 14 minutes. Turn the potli samosas on their sides and bake for another 5 minutes or until golden brown. Serve with the hot green chutney and the sweet and sour tamarind chutney, if desired. Wishing you potlis full of fun this weekend! Love that they are baked and not fried. These look yummy Sandhya! What a fantastic appetizer :). Love the comparison to purses and the photos! The baked potlis are so perfect with a golden sizzle and yummy stuffing. 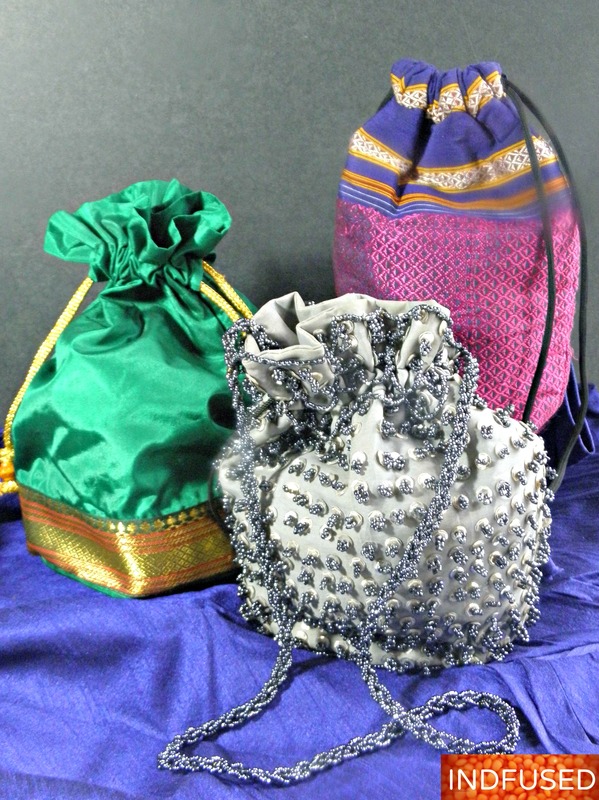 Loved your description of potlis with a picture of the actual potli bags we carry. A big thumbs up for baking them. Thank you so much Piyali for your sweet words of encouragement. I truly appreciate it! Thanks Sonal! Congratulations on your new website! I will keep this recipe. I will be catering a function at my daughter’s studio and she specifically asked for samosas. These ones are so elegant, and apparently easy, I thank you for the idea. I presume they are still good even at room temperature? So nice to hear from you, Hilda. 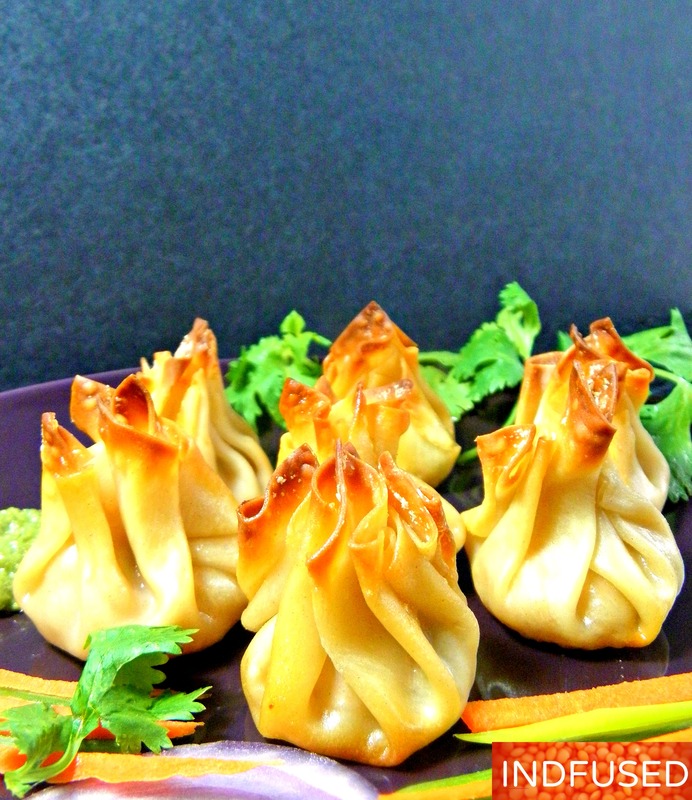 These samosas will be perfect for a function at your daughter’s studio! Yes they tasted great at room temperature. Do let me know how she likes them. Is your daughter an artist? All the best for the function! They look totally yummy, and I especially love the golden brown tips…. Thank you so much Santosh! Beautiful potlis Sandhya, and I even knew what potlis were (I know 3 or 4 hindi words) and potli is one of them :). What an innovative idea to have these bite-sized samosas encased in the gorgeous baked sheets. Did you use the same form that you used on the pedas the other day? Great idea! Diwali is coming up right? Are you going to town baking (metia) not sure of the spelling, but boy! we used to love those Indian sweets. I’ve never worked with wonton wrappers either, I must give that a go. Happy weekend to you. Still yucky and rainy here, but thankfully no hurricane in the forecast, I actually turned the heat on today it was freezing in the house, and 2 days ago it was in the 80’s???? The Poti Samosa’s look delicious, also the Poti that you pictured here are just beautiful. I especially love the grey beaded one. Thank you so much Suzanne. The grey beaded one is my favorite too. This is something I know my hubby would love if I can do it justice. Thank you! They are very easy to make. That looks so cute, healthy an delicious dear. Loved it! Thank you Indah! Yes I try and avoid frying as much as possible. Quick and easy appetizer samosas for the holiday parties! This isn’t just a must do, it’s a must do OFTEN! Thanks Greg! I like the sound of that! Thank you Judy! I want to use the wonton wrappers more- they are so easy to use, right? These are gorgeous Sandhya! I would never know they are baked either. Yum! Thank you so much! Yes, plus these baked ones feel guilt free! Will make these, like the potli look. Supe idea . Would puff pastry work? I actually have made fabric purses potli style.